Today was awesome. It was to start with another sidle section from Hunters Hut, following the Wairoa River Left Branch for the whole morning to Top Wairoa Hut, and I was expecting it to be a tough start to the day but it didn’t turn out too bad. 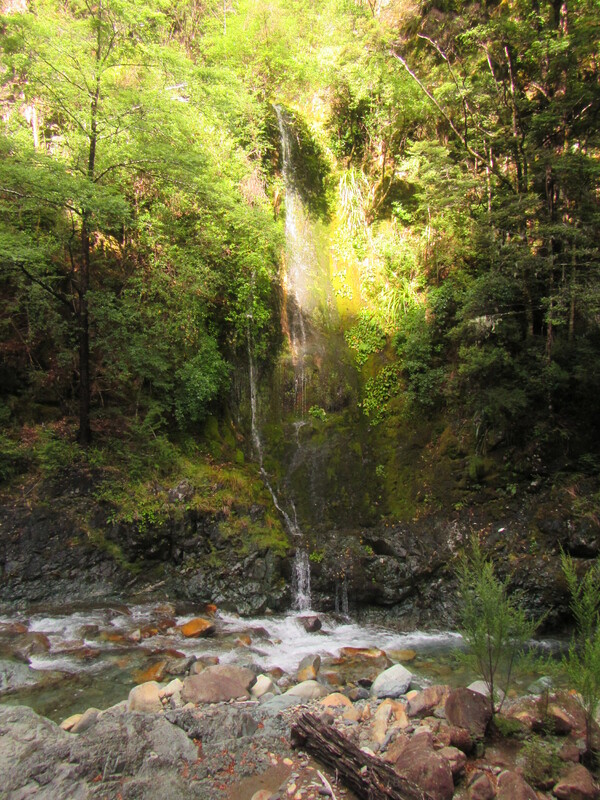 Initially the trail climbed high away from the river to avoid a cliff line but soon brought me back to the river. It was undulating along the river and necessary for the trail to climb up and down to avoid some treacherous features what would have been impossible to get around. It was a true sidle track to begin with, narrow, less than a foot wide, and some rock scrambles to get over with major drop offs to the river below. One section had a steel cable installed as a hand rail to keep trampers on the trail. The trail soon returned to the river and required multiple crossings as it switched sides of the river to find the flat ground and avoid cliff lines. Wairoa River is a moderate sized river with fast running water and heaps of small waterfalls churning down through rock chutes and large drop offs. There were no dry feet crossings to be had today with the river being wide enough to not allow the accumulation of stepping stone rocks in the middle. In flood this thing would be enormous and I can imagine the water easily moving massive boulders in should conditions. Today the water level was low and all crossings were easy enough to negotiate. The deepest crossing was just above my knees. I keep my shoes on for such crossings as you loose quite a bit of time constantly changing into sandals and shoes allow for safer foot placement and toe protection. It was beautiful along the river. So many photo opportunities and stunning features. Around an hour before reaching Top Wairoa Hut I bumped into two TA trampers heading north or NOBO. This first NOBO’s I’ve come across and the start of many more to come. We stopped and chatted for a few minutes outlining to trail ahead for each other. For me there were a few more river crossings and one feature the track notes pay particular attention to: a rock chute to climb around that sits above a 4m waterfall. The trail notes simply stating it could be tricky and if you loose your footing you go over the edge. Turns out this isn’t even worth mentioning in the trail notes and proved no more challenging than many other obstacles encountered already. Can you see the trail marker on the other side? 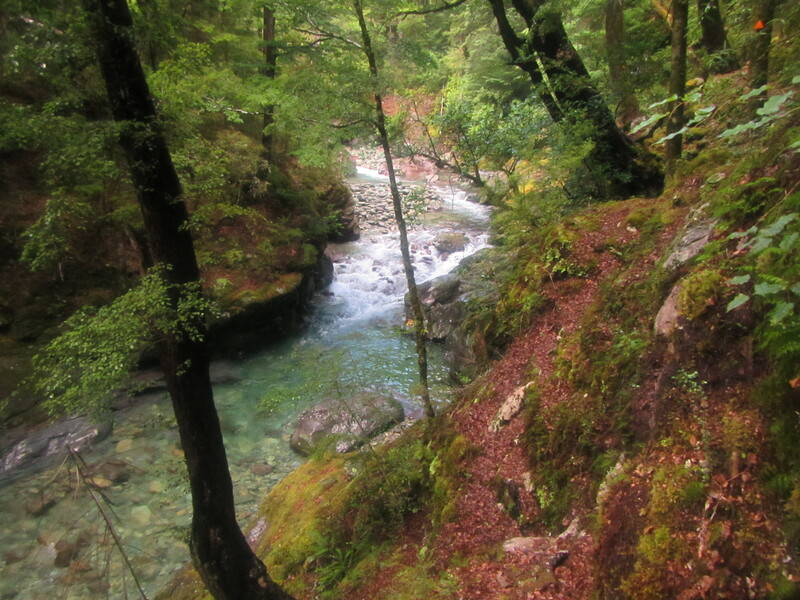 With the final crossings completed, the trail continued to climb, following the river upstream and out of the forest. Exiting the trees the surrounds completely changes. I’d been walking through beech forest and alpine passes for the past 4 days and was now looking at a landscape that wouldn’t be out of place in the outback. Red iron rich rock everywhere, stunted trees, grasses and teatree, and looking very dry. Whole hill sides were just rock. I stopped briefly at Top Wairoa Hut for morning tea and continued on. I had to climb high for the next few kilometres to get back up to another alpine ridge. From the hut the trail was basically on top of the rock itself for just about the whole way, scrambling over the tangled junble of rock. I’m not sure what sort of rock it was but it was grippy which was good, not only for shoe traction but it stopped the rocks slipping passed each other and moving like smooth river rocks do. On reaching the ridgeline I was treated to clear views for 360 degrees around but some misty cloud was hanging around the higher peaks. As I followed the ridge line the trail traversed across a slatey scree slope to avoid one peak and the mist started to come in. The route was marked by poles and was easy to follow for the most part. A few times I had to sit put and wait for the mist to clear to locate the next pole and move on. From the highest point, Mt Ellis, sitting at 1615m, the trail continued on rocky ground and scree steeply down to the left branch of the Motueka River. Hunters Hut was obvious sitting on a ridgeline in the distance but was still some 4km away and would take another hour to reach. I had my sights set on reaching Porters Hut today but my cut off time of 3pm to reach Hunters Hut was fast approaching. Following the river towards Hunters the trail continued on rock, scree and the odd swampy section thick with tea tree. There were large areas of bright green and black rock glittering in the sun. I’m not quite sure what type if rock it was, hopefully someone can help me out. I don’t think it was greenstone as it was too flakey and was like tightly packed sheets similar to mica. Anyway, seveal large banks of the stuff looked awesome in the sun. 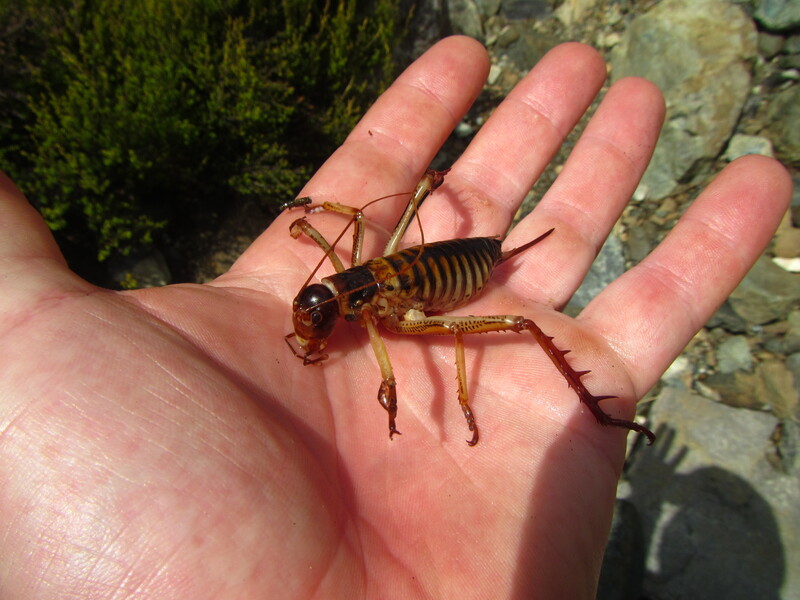 I came across a Weta on the trail as well. These insects, similar to grass hoppers I guess, are massive, the size of my palm. I was lead to beleive there was no water at Hunters Hut and on reaching the last river crossing before getting to the hut I had a decision. 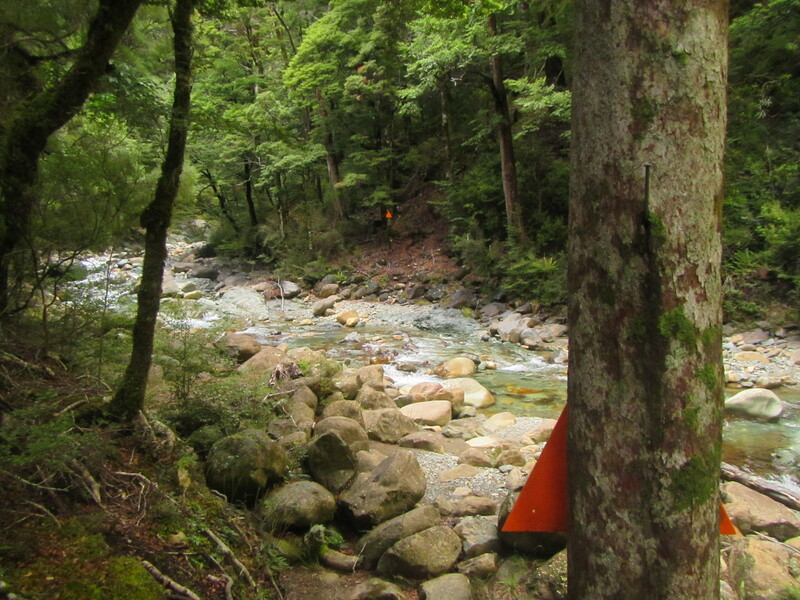 Fill up water at the river and stay at Hunters or continue onto Porters Hut and fill up on the way, thus avoiding carrying excess weight. I was still determined to continue onto Porters and pressed on but after the final climb upto the ridgeline where Hunters Hut was located I was buggered and decided I’d stay put for the night. It was close to 3:30pm and passed my cut of time. Porters was still 4 DOC hours away and I couldn’t be bothered continuing on. The scrambling over rock all day had taken its toll and I was feeling knackered. But it turns out staying put was a great decision. The hut sits high above the river with commanding views right around. There was a full water tank, so that that was no worries and the hut was one of my favourites to date. Clean, tidy, lots of windows, afternoon sunlight right through and I had the place to myself. Perfect. With a lazy afternoon, my first in a while, I lounged about, hydrating and reading the final chapters of Game of Thrones Book 3 part 1. 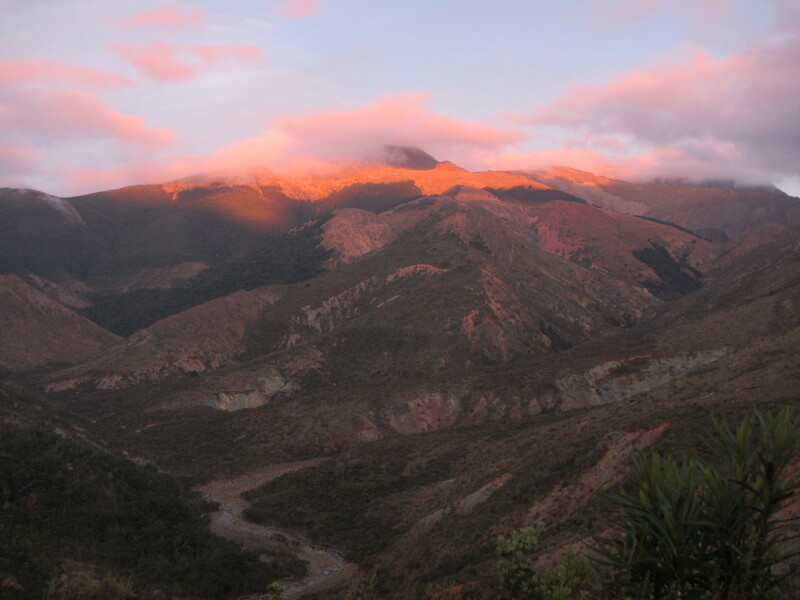 I was treated to an amazing sunset as well with the red mountain glow covering the higher peaks. It truely was Courtney. The river section was stunning.